Set up a single cell with a formula that will act as a single target value for solver. Select a range (or separate cells) containing values that Solver will adjust to reach its goal. Enter starting values in this range. Open the Solver dialog, specify the required inputs (including any constraints) and run the Solver. 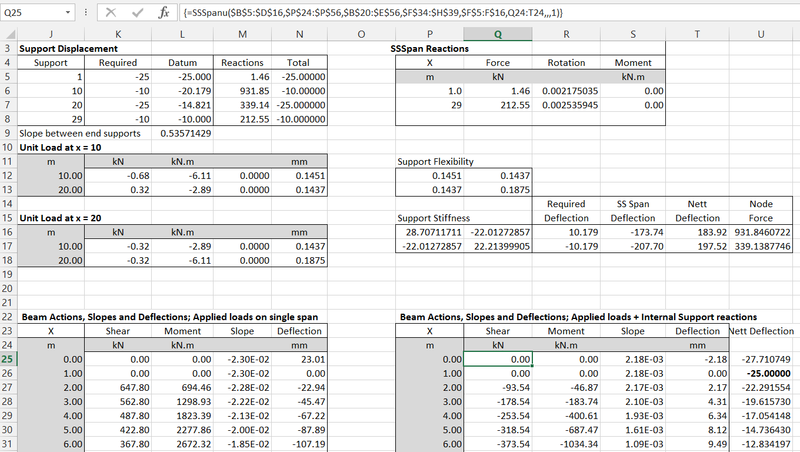 This example uses the ConBeamU User Defined Function (UDF) to find the beam deflections (also shear forces and moments) for the beam defined under “Beam Segments” and “Supports”, when subject to the specified Distributed Loads and Point Loads. Tne main function output is in columns K to N (hidden by the Solver Dialog box), but the deflections at the four supports are extracted with simple formulas in cells K4:K7. The required deflections are entered in cells J4:J7, and the difference of these two values squared is in L4:L7. The difference is squared because this will always give a positive value. In this case the ConBeamU function has been set up to return deflections in mm, but care must be taken to ensure consistent units. The Solver target value (or “Objective”) in Cell L8 is the sum of the 4 values in L4:L7. Each of these values must be greater than zero, because zero or negative values will be treated as a rigid support by the ConBeamU function. Having set up the Solver, click the Solve button, and the values in F6:F9 will be adjusted until L8 is very close to zero, as shown above. The constraints to keep all variable values greater than zero are no longer required. 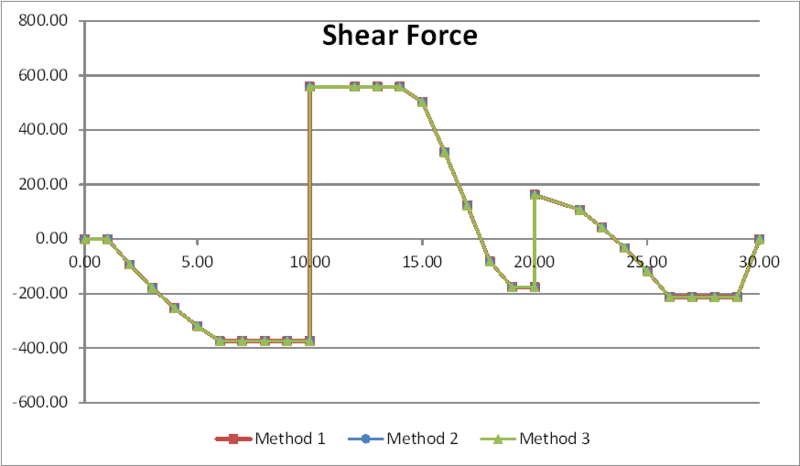 This procedure generates the correct shear forces, moments and deflections, because the artificial loads are applied directly to the supports, but to find the correct reactions the applied support loads must be added to the calculated reactions. It can be seen (column N) that this method finds exactly the same Nett Reaction forces as the first example. In the example shown above I have used the ConBeam UDF, which is not unit aware, so deflections are now in metres. The support stiffness has been set to 1E10 kN/m, and the artificial point loads are 1E10 x required deflection in m (Range G24:G27). The deflections are calculated immediately, and are a very close approximation to the required values (the maximum error is of the order of 1E-7 m). To achieve this order of accuracy the stiffness of the supports must be chosen carefully. If it is too low the relative beam stiffness will affect the results, but if it is too high round-off error has a significant effect. The best value for any given beam can be found easily by trial and error. The SSSpanU UDF is used to calculate the beam deflection under the specified (real)loading when supported by the end supports only. Upward unit loads are applied separately at each internal support, and a flexibility matrix is set up showing the deflection at each node position due to each unit load. The flexibility matrix is inverted to yield a stiffness matrix. The stiffness matrix is multiplied by the deflection required at each internal node to return the single span deflections to the specified support deflection. 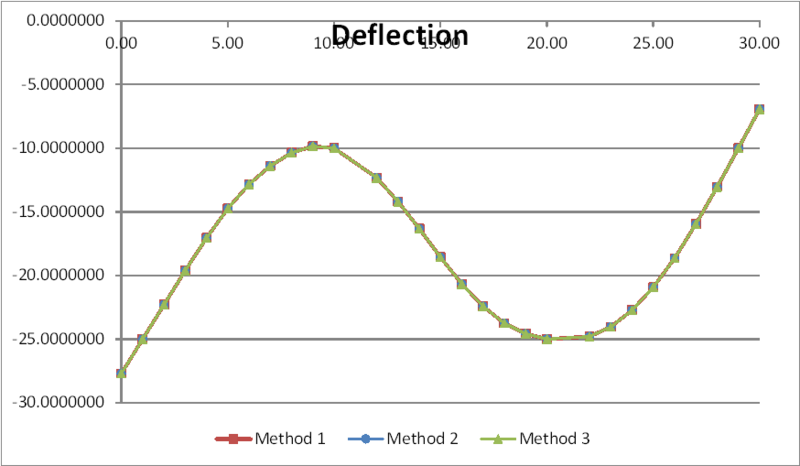 The resulting values are the internal reaction loads, that may be applied in conjunction with the real applied loads to determine the resultant loads and deflections of the beam. The end supports are defined in range F5:G7, and the real applied loading is in ranges B20:E23 (distributed loads) and F20:H23 (point loads). The applied unit loads at the internal supports are in ranges F26:H27 and F30:H31, and the resulting output at the internal nodes is in ranges K11:N12 and K17:N18. The support flexibility matrix is in P12:Q13, being the node deflections from cells, N12, N13 and N17 and N18. This matrix is inverted in range P16:Q17, using the MInverse function, to generate the support stiffness matrix. This matrix is then multiplied (using the MMult function) by the required beam deflections to find the support reaction at each internal support. Note that the required settlements are measured from a datum line between the end supports after settlement. The settlement of the Datum is shown in L5:L8, and the resulting required deflections at the internal supports at R16:R17. The internal support reactions are then applied together with the original loading in a single span analysis, with output in range Q25: T55. Finally the deflections must be adjusted for the deflection of the end nodes, as shown in Column U. The final reactions and deflections at the supports are also transferred to M5:N8. 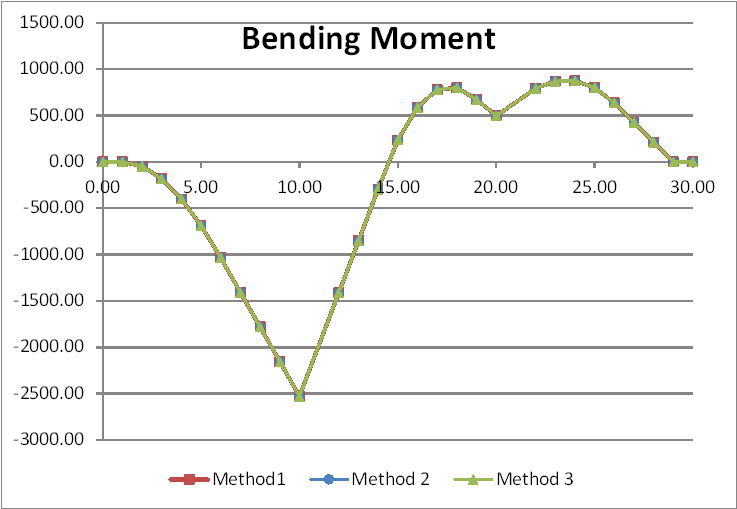 The results of the three different analysis methods, applied to a beam with the same loading and specified deflections, are shown in the graphs below, showing virtually identical results from each analysis. 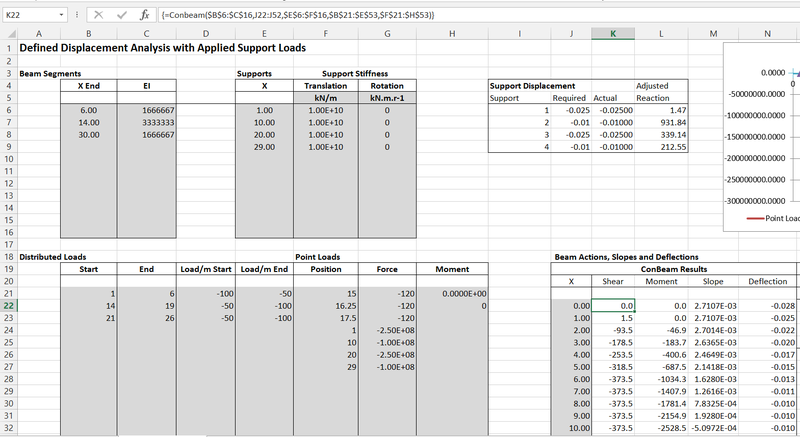 This entry was posted in Excel and tagged ConBeamU, continuous beam analysis, Excel, specified displacements, UDF, VBA. Bookmark the permalink.